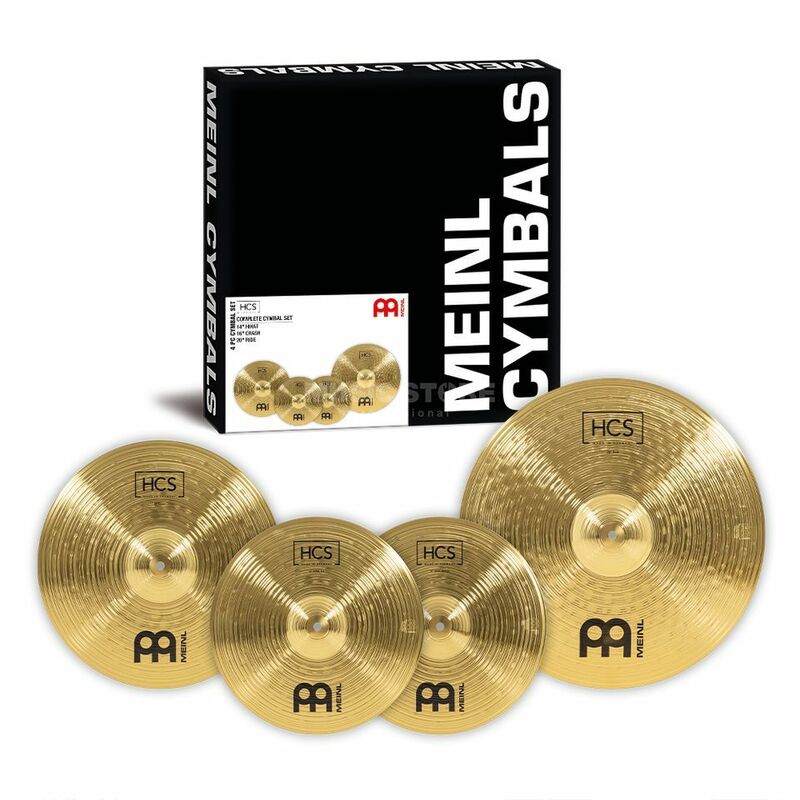 The HCS, Meinl beginner's cymbal series! With the HCS cymbals, Meinl is raising the bar for brass cymbals to new levels of quality. The HCS cymbals offer a professional look and great sound characteristics for a great price. All of the HCS cymbals are crafted from a MS63 brass alloy and are perfectly tuned to one another. They are primarily orientated towards beginners, but are also exceptionally suited as practice cymbals for more advanced drummers. Additionally the HCS cymbals boast a first-class price to performance ratio and are a fantastic value for money. The HCS cymbals are available individually as well as in pre-configured sets. As with most cymbals in the Meinl line-up, the HCS cymbals are made with help from the most modern computer guided production methods in Franconian Gutenstetten, Germany. The result is high-quality metals that promise longevity and enjoyment. 20" Ride sound: Clean, warm sound, with a defined ping and nice bell. Good for all situations. 16" Crash sound: Smooth attack with a medium sustain. Complex spread with a warm feel. 14" HiHat sound: A versatile hihat in medium weight. Warm, clean sound and an articulate open hihat. Very good cymbals for the price! When I order this cymbals I starting to wonder that thoose were not what I was expecting and I will regreat it but when they arrived the sound of tghe cymbals just blowed my mind. If you a cymbal with a warm sound and good management for a awesome price you should buy this pack. The Ride and the Hats sound amazing and the crash is just awesome. I order these cymbals to Portugal and they came in perfect condition and in a very short term of delivery. Excellent service, belive me. Though i'm a guitarist I wanted to branch out and give drums a go. My local practise room has a drum kit set up, all you need is to take your cymbals and sticks. I didn't want to waste money by buying really expensive cymbals as I wasn't sure if I wanted to pursue drumming, so I opted for these until I made a choice. Though not a drummer I was really happy with the quality of them. The crash creates a fantastic sound, and the ride too is fantastic. I purchased them alongside a Musicstore cymbal bag and they fit perfect into it. After almost 4 months they're still going strong. For beginners they are 5 stars but wouldn't hold up under proper use by a gigging band.